Fig. 1. The original 16-acre World Trade Center site prior to 9/11. The magnificent 110-story twin super skyscrapers (dark blue) sometimes cause outrageous high ground wind conditions. Of the four smaller buildings (yellow), only the hotel is considered unusually attractive. 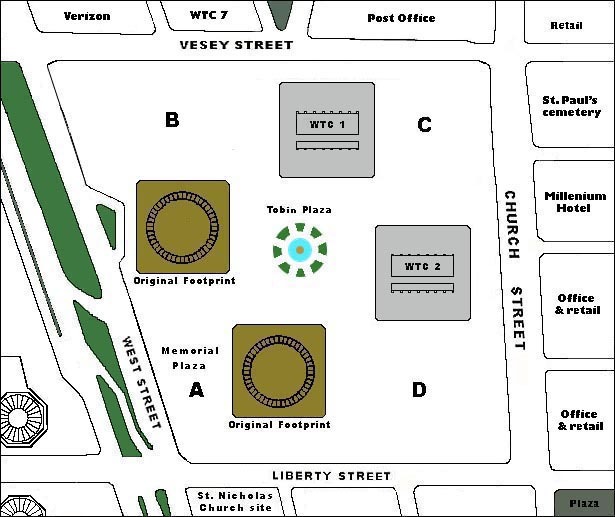 The iconic Koenig Sphere and fountain (light blue circle) are near the center of a somewhat impractical, dull, and unfriendly plaza. Original plans called for a more attractive and expensive plaza, and rebuilding the site could be an opportunity to correct the plaza faults. Delivery vehicles entered at the south side of the site. Fig. 2. 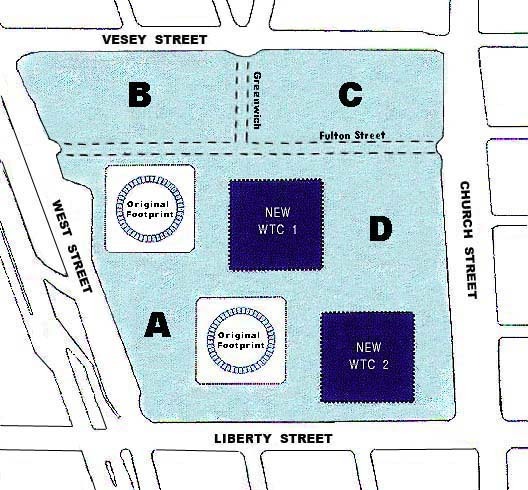 The original Gardner concept: The two (white) original footprint memorials and the two (blue) similarly arranged new super skyscrapers (WTC 1 and WTC 2) complement each other. Other site plans are possible and the site dimensions can be increased slightly. The above shifted site plan is meaningful, forms an attractive pattern, and restores the skyline. The new twin towers are located 300 feet 'east' and 40 feet 'south' of the original footprints. (Just shifting the towers 300 feet horizontally would result in a less attractive "blocky" pattern.) The new towers are above train lines (bad) and the towers and memorials are possibly inappropriately close. Footprint memorials would be based on victims' families' recommendations. Ancillary buildings are not shown. Wind and sun conditions should be considered; there will be high gusts. 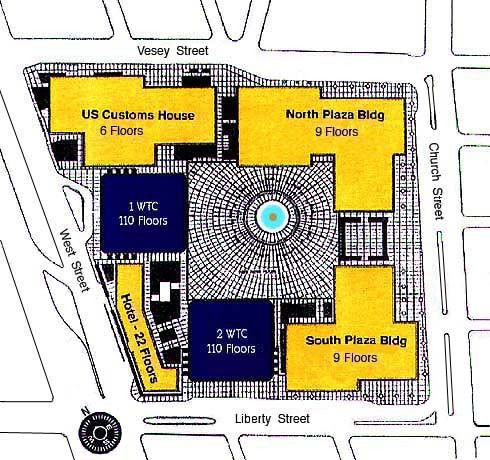 Entrances to the PATH and subways would be located at position C or D. The Koenig Sphere and fountain might be restored. Suggestions are welcome for possible construction at positions A, B, C, and D.
Fig. 3. Above is the site plan of the model shown on this web site. Original footprint memorials and the Memorial Plaza are based on victims' families' recommendations. WTC-1 and WTC-2 are new 115-story twin towers. Modeled on the successful Time-Warner Center, these towers are presently planned to have commercial space on the lower floors, hotel space on the middle floors, and residential and public space on the the upper floors. WTC-3, WTC-4, and WTC-5 are 12-story buildings. Streets might be underground. WTC-2 and WTC-3 are attached. WTC-5 might be replaced with a park. Church Street width might be reduced. The proposed outdoor footprint memorials and proposed Memorial Plaza are shown below. Fig. 4. These are two different outdoor memorial designs proposed for the site plan above (west view). Most prefer the left design. The granite wall sections with the names of the deceased are not shown in this photo. An alternate proposed indoor memorial design is shown elsewhere on this web site. 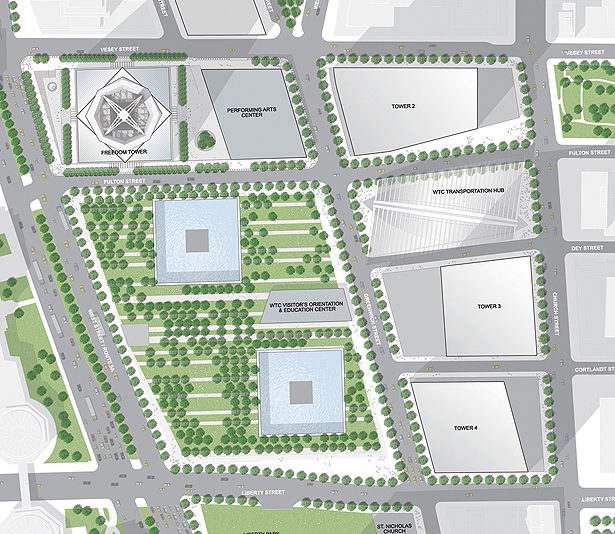 The optional Memorial Plaza or Park behind the curved wall was designed by a family member architect, and could be added to the Libeskind plan at a later date. Fig. 5. 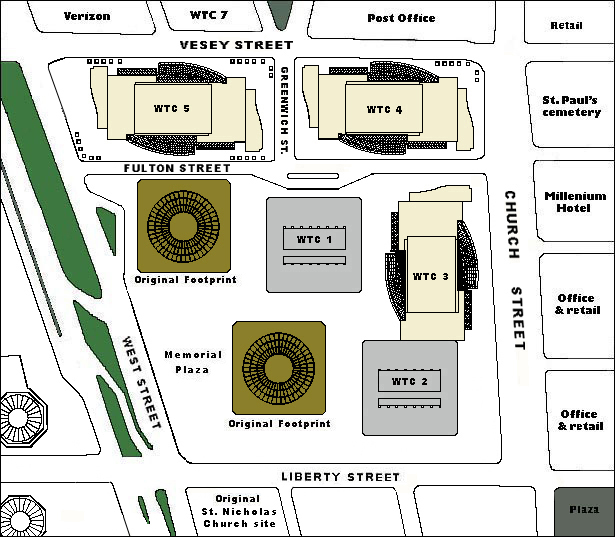 A logical and practical symmetrical version of the site plan with the super block, Twin Towers, Tobin Plaza, Koenig Sphere, and fountain restored. The memorials and new towers have the same relationship to each other. This is probably the best basic site plan, and it corrects the faults of the original plaza. An upgraded Tobin Plaza (or park) buffers the site elements, provides good flow and views thru the site, is people friendly, historically meaningful, reduces morbidity at the site, and helps meet the high standards expected at a national memorial. Buildings are not above train lines, and restoring the super block without above ground streets adds quality space and negates the need for embassy building standards. Original footprint memorials and the Memorial Plaza would be based on victims' families' recommendations. WTC 1 and WTC 2 (the new twin towers) could be connected by skybridges. Wind and sun conditions should be considered. Site winds will be different from the original site (hopefully better) and should be analyzed with wind tunnel testing. Probably Greenwich Street could continue underground through the site. Possibly the best basic design for position A is the proposed Memorial Plaza shown in fig. 4 above. The Freedom Tower foundation and materials could be used for a shorter conventional building at position B. Visitors centers and Path and subway entrances could be anywhere on the site, particularly position C. Some security and administration offices could be located at position D since delivery vehicles would enter the south side of the site. Suggestions are welcome for possible construction at positions A, B, C, and D. WTC 1 could be shifted 20 feet east. Modifications to the No. 1 subway crossing the site would not cause service interruption. Brace yourself for the official LMDC plan below. Fig. 6. The LMDC site plan - a plan without meaning. All streets (except Greenwich) crossing the site will have negligible impact on traffic patterns, but are unsuited for security and will consume valuable space. Greenwich Street would be benificial but it will be inconveniently blocked for security; instead it should be underground. Infrastructure is an impractical intertwined mess. The memorials are designed mostly underground, and eventually might have to be closed or abandoned. 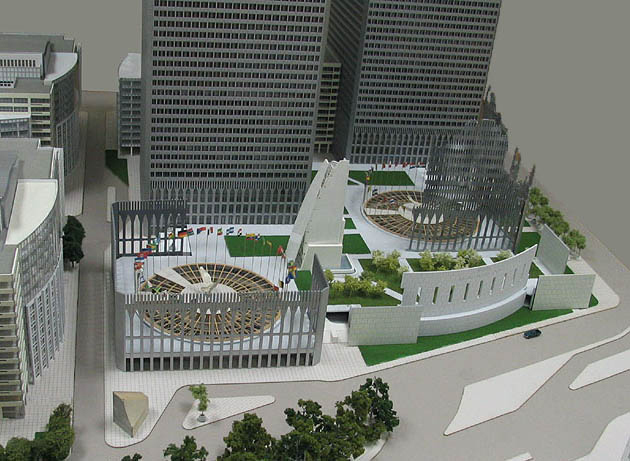 The memorial architects want no artifacts above ground; the Koenig Sphere and fountain are gone, but the Koenig Sphere can be seen underground for a fee. The fortress-like Freedom Tower is above a train line and will be out of place and inappropriately near the memorial. The Freedom Tower would be the tallest building in New York and a landmark structure, but private industry would never build this special building at this poorly chosen commercial location. The Calatrava "Transportation Hub" is an expensive useless giant modern art sculpture that costs as much as one Twin Tower would. Since Trump's comments the Freedom Tower has been completely redesigned with better Coney Island techniques, but it is still at a bad location and will either be sold for a large loss or will be a taxpayer subsidized white elephant. Where is "Libeskind's genius" to be found? The memorials, Freedom Tower, street plan, Calatrava sculpture, and Vehicle Security Center are gross mistakes of urban planning that will be taught as an example for future generations to avoid.